In 1903, Berkshire Museum founder Zenas Crane, inspired by such institutions as the American Museum for Natural Science, the Smithsonian, and the Metropolitan Museum of Art, decided to blend the best attributes of these establishments in a new museum for the people of Western Massachusetts. Thanks in large part to Crane’s efforts, the broad and varied collections of Berkshire Museum include objects from virtually every continent, from important fine art and sculpture to natural science specimens and ancient artifacts. Important Hudson River School works by Albert Bierstadt, Thomas Cole, Thomas Hill, George Inness, Thomas Moran, and Aaron Draper Shattuck are all represented in the Berkshire Museum’s collection. The paintings are detailed representational renderings of wilderness scenes, whether a view of a verdant valley, a thickly forested mountainside, or the expanse of a mighty river. The play of light on the landscape, an expanse of sky, or the tumbling water in a fast-flowing stream expressed the skills of the artists in carefully observing and then rendering the realistic scenery. The collection from Turtle Bay Exploration Park. Forty- eight photographs from a selection Adams made himself to serve as a representation of his life’s work. Included are many of Adam’s most famous images; elegant details of nature, portraits, architectural studies, and breathtaking landscapes for which he is revered. Called “The Museum Set,” these works reveal the importance Adams placed on the drama and splendor of natural environments, from Yosemite National Park to a secluded grove of aspens; from the Sierra Nevada range to a barn in Cape Cod. Included are many of Adams’ most famous and best-loved photographs which encompass the full scope of his work: elegant details of nature, architectural studies, portraits, and the breathtaking landscapes for which he is revered. The exhibition also includes a photo portrait of Ansel Adams by James Alinder. 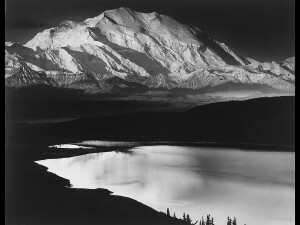 In a career that spanned more than five decades Ansel Adams became one of America’s most beloved landscape photographers and one of its more respected environmentalists. There are few artists whose name and works represent the extraordinary level of popular recognition and artistic achievement as that of Ansel Adams. This museum is very family friendly with something for everyone!